Korea's Information Society: Why the dark cloud over world TV market? I've long been interested in the fortunes of Korea's television and display industry. Digital displays and television sets form a major part of this nation's ICT sector, as noted in my previous post. So the article in the English Chosun Ilbo headlined "Dark Cloud Hangs over Global TV Market" naturally caught my eye. It reports on market research showing a drop in sales of flat panel TV sets. It also notes plummeting prices and suggests that one reason for the decline "...is that this is a year when neither the Olympic Games nor the football World Cup are held, since they happen in alternate even years." While that may be one contributing factor in the short term, there are other more important reasons for the longer term trend. As shown in the accompanying graphic(click to see a full-size version)LED backlit LCD televisions began to dominate the market starting in 2010. However, another important trend took place in the market over approximately the same time period, namely the introduction of smart phones and tablets! 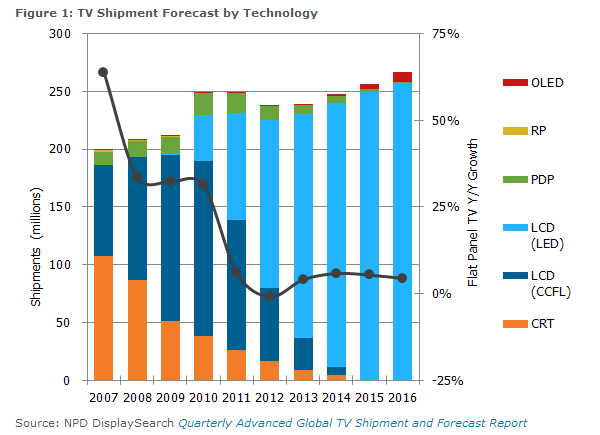 Indeed, as Andrew Tonner of Motley Fool suggests in a blog post "One of the interesting sides from the explosion of the global tablet market has been its negative effect for not only the PC market, which we've seen, but now also the TV market." This would seem to be the main reason for declining TV sales this year, without discounting the absence of a globally televised sports event. Coincidentally, it also helps to explain why the TV semiconductor market is growing, despite the decline in TV shipments. 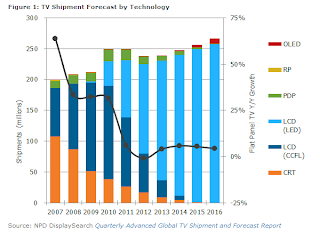 As noted by Digitimes, "Technologies such as wireless video connections, networking interfaces, multi-format decoders and LED backlighting have boosted the average semiconductor content in TV sets even as global TV unit shipments are forecast to decline by an estimated 3% in 2013."